North American Travel offers two kinds of services available from Vallarta’s airport to any hotel in Vallarta, Costalegre, and its surroundings. 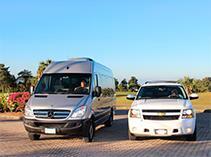 All our vehicles are air-conditioned and can accommodate up to six passengers. Other people arriving at the same time and requiring their transportation to a hotel close to yours will share transportation with you. Our waiting times are very short as our vehicles are always available at the airport. Please note that in order to be able to offer this service at its low price a 2-person minimum restriction applies and transfer services to private houses cannot be provided (these are available through the VIP service). A maximum of 7 persons are permitted per vehicle. Our VIP service takes you directly to your hotel. It is the best option if you are traveling with family or in small groups. There are no extra stops or waiting times with this personalized service. A maximum of 7 persons fit comfortably per vehicle. Upon arrival at the airport, and once you have cleared immigrations and customs, please do not stop until you see one of the North American Travel representatives who will be waiting for you outside the Arrival Gate, displaying a banner with your name and/or the logo of North American Travel. Please note that customs procedures can take from 5 to 45 minutes depending on how many people are waiting in line. Please do not worry - we know this and will be waiting for you outside the Arrival Gate. Please note that at the Vallarta airport are many Time Share companies trying to contact you. We strongly recommend to talk ONLY to the representative of North American Travel in order to avoid the loss of your purchased service. Once you have contacted our staff at the airport, please present the confirmation voucher together with valid photo identification. You will then also be given the exact time of pick-up on your departure date, should you have reserved a round-trip transfer. Transportation service from 10:00 p.m. must be booked only under Private basis . Please if you are traveling with your pet tell us in advance and book only private service. NOTE: Passengers traveling in a wheelchair is necessary for safety and comfort reserve service in Private mode.